BoyleSports are a well-trusted bookmaker brand, having been part of the high street sports betting scene since 1989. Since then, they’ve swallowed up plenty of other stores and names such as many belonging to William Hill – and it therefore makes sense that they offer a keen sportsbook and online betting service for those punters who prefer to play at home. UP TO £25 IN FREE BETSNew Customer Offer. T&Cs Apply. 18+. Please Gamble Responsibly. The BoyleSports site offers a selection of different sporting events to bet on, with something to suit everyone. BoyleSports betting enthusiasts have access to a brilliant range of sports and events to bet on from minute to minute, with a comprehensive sportsbook and easy-to-use interface awaiting anyone interested in taking up the brand on their £25 free bets deal. Check out the BoyleSports virtual bet offerings as well if you like these games. The welcome deal for any betting or bingo site is never the be-all and end-all, however. It’s worth us looking into terms and conditions, mobile site options, payment services and more besides. While betting sites can really lavish you in free cash when you first join, how many of them are worth sticking around with? As this brand is already well-regarded in the world of betting full stop, it’s safe to say hopes are high for the online version of their sportsbook, particularly as they maintain a healthy presence to this day on the high street. Let’s continue with our BoyleSports review to find out what they’ve got on offer. There are plenty of ongoing promotions available here at any one time, meaning it’s safe to say regular punters and those loyal to the site will be free to enjoy a huge array of cashback and free bet opportunities providing they log in and place bets on a regular basis. Visit our list of best betting sites here to find out more about the various offers available. 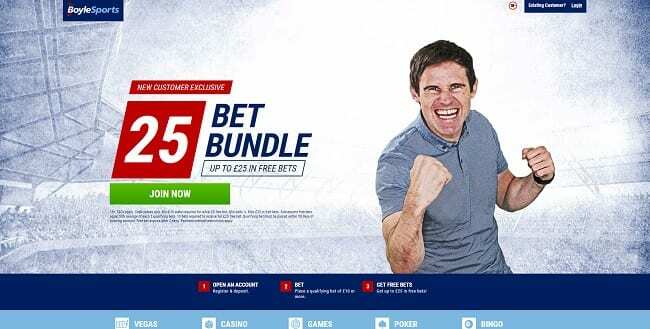 The current BoyleSports Betting promo code for April 2019 available to new customers will grant you a respectable £25 to use on bets, meaning there’s even more available to entice you to stick around and to place a few punts on some outstanding odds. The terms and conditions for this opening deal are relatively straightforward, though it does of course always make sense to look a little more closely at the fine print in your own time. This opening BoyleSports Betting promo code will grant you up to £25 in free claimable bets providing you pay and stake on the site with at least £10. For a £10 stake, you’ll be able to claim a free £5 to use on a variety of sports, events and games, though you’ll need to bear in mind that a minimum of even odds must apply. To receive the full £25, you’re going to need to make around 13 bets of your own. In all fairness, this is a nice little deal which will appeal to regular punters, and while it may not give you masses of cash back, it does at least help to keep your game going on for longer. Other promotions available on-site include those which are tied into certain sports and events. For example, double winnings can currently be activated across selected Europa League football games and across all NFL matches – meaning if you’re feeling lucky enough, you can effectively double your money. Check out our NFL betting page to see more brands offering this market. What’s more, the site will also throw in a free £5 accumulator bonus for every five combination sport accumulators you take on at the same value. That’s buy five, get one free. BoyleSports Betting markets are fairly broad and offer fantastic value. They support some of the best leading odds in the UK, meaning that you can rather safely depend on this site to provide you with predictions that are likely to pull off and to grant you a bit of cash back. The site boasts a massive array of different sports and events for you to punt on, meaning that if you prefer football and NFL to your age-old horse racing and greyhound racing standards, you can leap right in. It’s also chock-full of big odds for boxing, cricket bets online, motor racing, snooker online betting and even table tennis. The interface can seem fairly busy to new users but the beauty of it lies in the fact that you are given an enormous amount of control over what you can bet on and which sports you can outright ignore if you want to. In-play and live betting is actively encouraged here, too, meaning you’ll be able to take advantage of even better odds once things are underway. These days, in-play betting is fast becoming a standard at bookmakers on the high street and online, and the BoyleSports Betting live bet service is very hard to beat indeed. Check out all of the day’s biggest sporting events and play along with them. If things aren’t quite going your way – switch sides and punt on the likely winner! BoyleSports horse racing tends to take centre stage, mainly because the brand is heavily invested in this particular sport – so if you’re a big fan of the gee-gees, this is a site worth looking into. Click here to see more brands offering great odds on horse racing events. The BoyleSports Betting sportsbook is fantastic at giving you complete access and control over your bets and filtering out what you do and don’t want to see. While the interface may seem a little complex to begin with, it’s extremely user-friendly. Simply work your way around the site and filter in your favourite markets, events and teams. This way, you can keep track of live events, upcoming odds and all of your markets at once. It’s a system which is well worth getting involved with. The software has clearly taken some time to develop into its current form, and we think it’s well worth the price of admission. This means you’ll be able to top up your account through your mobile phone bill – massively convenient! There are plenty of Boku sports betting sites available now online if this is your preferred method. Withdrawals are straightforward, too – meaning you can cash out to any of the major methods listed above within a day or two. E-wallets and online services will process cash quicker than bank and card services, however – so do set yourself some time aside! BoyleSports Betting mobile sportsbook bet options are just as comprehensive and as pleasing as the desktop model. While there are perhaps more streamlined and watered-down mobile apps available, this model focuses on perfect functionality. Check out shortcuts for placing bets and checking out markets – there will never be a need for you to travel to and from the main screens unless you need to. You may also be able to grab hold of some fantastic free deals and access to exclusive markets through the app and mobile site, too – meaning it makes even more sense than ever to take your betting on the go wherever possible. The mobile site is responsive and well-designed, too – very much recommended. As with the desktop version of the site, you simply need to go directly to the main login page from your mobile device and login as usual. From there, you will be able to sign in and access all of your bets and markets as you normally would from your PC. The same system works with the mobile app – use your normal login to access a world of bets across various devices with ease. As you can tell from our BoyleSports Betting review, it is an overwhelmingly competent and comprehensive betting platform which offers plenty to casual and seasoned punters alike. The opening welcome deal is worth getting interested in alone – but beyond this the brand’s main sportsbook and in-play betting options offer tons of scope for those betters who like to take advantage of several sports at any one time. What’s more, the flexible sportsbook interface also allows you to personalise your betting habits easier than ever before. There’s very little we have to say that could be considered negative about BoyleSports in general – only that the interface can get some getting used to, but when you do, it’s an absolute asset. Download the app for free or sign up online.